Japan’s Antarctic whaling program was ruled illegal in March by the International Court of Justice (ICJ), yet Tokyo is pushing for a return. With another showdown looming at September’s International Whaling Commission (IWC) meet, is it déjà vu all over again for Japanese whaling watchers? On March 31, former Sea Shepherd activist Pete Bethune was among onlookers at The Hague’s International Court of Justice when it handed down its ruling on Japan’s Southern Ocean “research whaling” program. Coming after nearly four years of deliberations, the ICJ’s decision by 12 votes to four (Japanese Crown Princess Masako’s father was one of the four dissenters) to support Australia’s argument that Japan’s “JARPA II” program lacked scientific merit was seen by many as a circuit breaker. “The ruling was unbelievable – and for me to be in the courtroom when it got handed down was pretty special,” said Bethune, who gained the international spotlight after being jailed for boarding a Japanese whaling ship. “This was the first time that any international court, let alone the ICJ, had been asked to rule on the questions that Australia raised before the court. So it was a complete unknown as to how the court might respond to the arguments Australia presented. To have such a resounding win in those circumstances was really quite exceptional,” he said. For its part, Japanese government spokesman Nori Shikata said the court ruling was highly regrettable. “We are deeply disappointed and regret that the court ruled that Japan’s research whaling program in the Antarctic did not fall within the special permit clause of the treaty,” he told reporters. Since 2005, Japan has caught around 3,600 minke whales and a number of fin whales under the JARPA II program. However, the ICJ noted the limited research outcomes from the whaling with just two peer-reviewed papers produced, based on results from just nine whales. Commercial hunting of whales remains prohibited in the Southern Ocean Whale Sanctuary, which gained the designation from the IWC in 1994. Japan signed the moratorium on commercial whaling in 1986 and argued that it was in compliance with the International Convention for the Regulation of Whaling. It asserted the program aimed to collect scientific data on the moratorium, contributing to the management of Antarctic minke, humpback and fin whales, with lethal methods “indispensable” to the program. However, the ANU’s Rothwell noted that Japan still had the option of returning to the Southern Ocean under a revised research program. “The court’s judgment set out multiple parameters around which Japan could seek to devise a new program consistent with those parameters and with the terms of Article 8 of the convention. That would involve consideration of the species of whale taken, the quotas being issued in terms of the number of whales, the balance between lethal research into the species and non-lethal research,” he said. “Japan certainly has got a lot to work with in terms of the court’s judgment,” he noted. As predicted, Japan’s Fisheries Minister, Yoshimasa Hayashi, said in April that the government would submit a new Antarctic research program to the IWC in line with the court’s decision, with “hunting plans” for 2015-16. Meanwhile, Japan’s research program in the north-western Pacific would continue “by reducing its scale…in view of the verdict,” he said. “In line with international law and scientific principles, our nation will carry out research whaling to get the scientific information essential to manage whales as a resource…We will stick to a basic plan that aims at a resumption of commercial whaling,” Hayashi was quoted saying by Reuters. 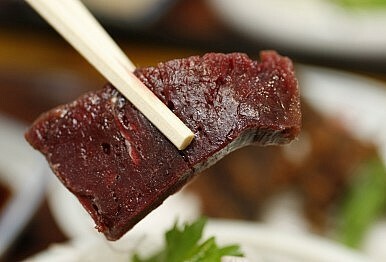 The announcement followed a Diet resolution demanding the Abe government continue to support Japanese whaling. “Japan’s whaling is based on scientific reasons, while counterarguments by anti-whaling groups are emotional, saying they are against the hunts because whales are cute or smart,” said Shunichi Suzuki, a Lower House member of the Liberal Democratic Party, according to The Japan Times. The Sydney Morning Herald reported Japan’s plans to dispatch four ships and a security vessel to the Southern Ocean in 2014-15, using biopsy guns instead of harpoons as part of a “non-lethal” expedition. The ships would be limited to “sightings, surveys and biopsy sampling” ahead of plans to resume a “lethal” hunt the following year. Australia’s Greens party spokesman Peter Whish-Wilson urged the Australian government to block the plan, while a Sea Shepherd Australia spokesman said it would “definitely” return to the Antarctic to track the Japanese vessels. In response, Australian Environment Minister Greg Hunt told the ABC that his government “remains opposed to whaling” and he did not expect the IWC would approve further research whaling. Further confirmation of Japan’s intentions came in June, when its Fisheries Agency said it had killed 30 minke whales off its north-east coast in the first hunt since the ICJ ruling, albeit its smallest catch in such waters since 2003. The fleet returned to port in July after catching a reported total of 90 endangered sei whales and 25 brydes whales in the North Pacific. Branded a terrorist by Japanese authorities, Watson warned that Sea Shepherd would resume its harassment of Japanese whaling vessels should they return to the Southern Ocean. In a June 10 press conference at the Foreign Correspondents’ Club of Japan (FCCJ) in Tokyo, Morishita claimed that the ruling ostensibly supported commercial whaling. He pointed to sections purportedly supporting “the orderly development of the whaling industry,” as well as claiming that it did not ban lethal methods of research whaling nor the sale of the whales caught during the process. Morishita noted the court’s ruling that Japan “will take account of the reasoning and conclusions contained in this judgment as it evaluates the possibility of granting any further permits,” saying a new program would be developed in line with the ICJ’s decision. Morishita defended Japanese whaling as part of the nation’s cultural traditions, comparing it to other Asian sacred animals. However, Patrick Ramage, head of the International Fund for Animal Welfare’s whale program, criticized the “cultural heritage” argument stated by Morishita and Abe’s defense of whaling. “Claiming an attack on one’s culture in an attempt to preserve the narrow interests of a small cadre of government bureaucrats is beneath the stature of a world leader such as Prime Minister Abe…The ‘Cool Japan’ that Prime Minister Abe so badly wants to sell to the rest of the world will fail if Japan continues to pretend that eating whales somehow protects and promotes its proud cultural heritage,” he told the Number 1 Shimbun. Nevertheless, Japan’s Fisheries Agency reportedly is set to press ahead, having told the IWC’s scientific committee that it would submit a new proposal concerning Southern Ocean whaling by no later than November. The submission would be subject to initial review in January and final review in mid-2015. However, the New Zealand government reportedly intends to stymie the move at September’s IWC meeting by proposing that no further special whaling permits be issued until assessment by the IWC scientific committee, which next meets in mid-2015. Given that the IWC meets biennially, if Wellington’s proposal is adopted Japanese research whaling could be blocked until at least 2016, the Sydney Morning Herald said. Despite the stated plans of its whalers, the Japan watchers polled by The Diplomat saw little prospect of a return to full-scale scientific whaling in the Southern Ocean. “Even at 1,000 whales a year from the Southern Ocean, the whaling program loses $10 million annually, and that’s when it is not being harried by Sea Shepherd. They now have to scale this down dramatically to avoid running directly into the ruling, and weather even tougher criticism from anti-whaling countries such as Australia, which now feel vindicated by the world court,” said David McNeill, Tokyo-based correspondent for The Economist. Whaling analyst Atsushi Ishii of Tohoku University has suggested a genuine research whaling program could involve catching as few as 10 whales – an uneconomic number for the costly expeditions. According to AP, an initial subsidy for the program of around 500 million yen ($5 million) a year, or around 10 percent of its costs, has since grown tenfold to exceed an estimated 5 billion yen ($50 million) for the year to September 30. Rising fuel costs and security measures against Sea Shepherd activists have added to the financial burden, while the mother ship, the Nisshin Maru, is reportedly in need of a major refit costing millions of dollars. Proceeds from sales of whale meat have also declined, with consumption dropping to 4,600 tons in 2012, down 35 percent from its 2006 peak, causing a growing stockpile of unsold meat estimated at 5,000 tons. According to an Asahi Shimbun report, retailers have posted another sales drop following a move by online retailer Rakuten to cease whale meat sales. An Asahi Shimbun poll conducted in April found only 14 percent of respondents said they had occasionally or rarely eaten whale meat, with 37 percent, including half in their 20s and 30s, saying they did not eat it. While the same poll found 60 percent support for Japan’s research whaling continuing, opinion was divided on the ICJ’s decision, with 40 percent saying it was reasonable and 39 percent disagreeing. “Generally the Japanese public, politicians and bureaucrats are very amenable to international decisions, so the ruling was accepted by the Japanese public,” Ishii said. Former fisheries official Masayuki Komatsu has accused the Japanese government of deliberately losing the ICJ case, a claim rejected by officials. Yet Ishii said the Fisheries Agency was pressing ahead with plans for further research whaling for political reasons, despite knowing its poor chances of success. “The Fisheries Agency knows that research whaling in its present form will not get the approval of the IWC’s scientific committee…but the parliamentary league for whaling promotion adopted a motion in the Diet to continue, making it very difficult for the agency to say it’s impossible,” he said. Although not subject to the ICJ ruling, Japan’s North Pacific research whaling could also face a ban if similar rules applied, experts said. ANU’s Rothwell said the court’s methodology and analysis of JARPA II “provides some parameters for a challenge” against similar whaling in the North Pacific. “If a state was so minded to do so, upon close analysis of the North Pacific program, it could certainly seek to rely upon the precedent of the whaling case to challenge the North Pacific program. Having said that, the North Pacific program is constructed quite differently, it’s a much smaller program and so whilst there are some commonalities, the programs are quite different,” he said. Tohoku University’s Ishii said the ICJ decision had made Japan’s research whaling illegal under the CITES convention, which bans the trade of endangered plants and animals. “The Japanese government’s logic has been that the North Pacific program is pure research…but the ICJ decision made it very clear that it isn’t science, making it a clear contravention of the CITES convention. In 2016 there will be a CITES conference in Capetown, South Africa, and I’m sure some countries will raise this issue,” he said. In the past two seasons, Japan has caught about 550 whales in the North Pacific compared to 350 in the Southern Ocean, according to ABC News, highlighting the area’s importance to Japan’s whaling industry. The other option of a complete withdrawal from the IWC is considered unviable for Japan, particularly given increasing regional tensions. “Japan is involved in a dispute with China over the Senkaku islands, and it’s always pointing out how China is wrong to attempt to change the status quo in the region and that it must obey international law,” said Justin McCurry, Tokyo-based correspondent for The Guardian. McCurry said Japan could even seek a more liberal framework for coastal whaling, as a “quid pro quo” for observing the ICJ ruling. Ishii said coastal whaling “is the only way for Japan to continue whaling after the ICJ decision,” suggesting it as a possible negotiating card at the upcoming IWC meeting, in return for the end of research whaling. He said the resumption of coastal commercial whaling would require a compromise from the anti-whaling countries at the IWC, with Japan likely having to accept stringent scientific management procedures, including safeguards concerning certain whale stocks. The coastal solution has also been promoted by high-ranking Japanese officials, given the poor economics and negative image of the nation’s deep-sea whaling. In 2009, Taniguchi Tomohiko, former deputy press secretary of Japan’s Ministry of Foreign Affairs, urged the nation to “abandon research whaling and negotiate to make local whaling more profitable” due to the impossibility of resuming commercial whaling. Former Sea Shepherd activist Bethune said such a move could even see Japanese whaling “sink off the conservationists’ radar” in the same manner that commercial whaling by Iceland and Norway in their own waters attracts relatively little attention. Such a move would also improve ties with the anti-whaling United States and Australia, seen as key allies concerning the broader geopolitical issues facing Japan in North Asia. For a nation that prides itself on its cuisine’s cultural heritage, maintaining the whaling tradition without offending others might appear a highly palatable option. Author’s note: A spokesperson for Japan’s Institute of Cetacean Research failed to respond to questions on the whaling issue. For more information on the background to Japan’s whaling, refer to “Why Japan Keeps Whaling,” published by The Diplomat on December 10, 2010.